MILWAUKEE – Consumers Digest recently named Johnson Controls Best Buy award winners for two Coleman® Echelon™ Series modulating gas furnaces models for outstanding efficiency ratings, fuel-conserving features and improved homeowner comfort. The designation also considered ease of use, maintenance requirements and quality and reliability. The variable-speed model features an electronically commutated motor (ECM) that delivers up to 98 percent Annual Fuel Utilization Efficiency (AFUE), positioning the unit among the industry’s most efficient gas furnaces. The second Echelon model recognized by Consumers Digest uses a permanent split capacitor (PSC) motor to deliver a 97 percent AFUE. “We’re thrilled to receive this award from Consumers Digest. It is a testament to our commitment to providing our customers with quality, energy-efficient products that make their homes more comfortable,” said Liz Haggerty, vice president and general manager, Unitary Products Group, Johnson Controls. Both units are conveniently compact and stand at just 33 inches, making them the ideal solution for applications where space is limited, including closets, attics and basements with low ceilings. 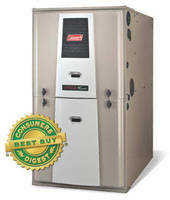 Homeowners who install one of the furnaces in their homes will also appreciate the unit’s quiet operation. These Coleman Echelon furnaces are ENERGY STAR® qualified and come with a lifetime limited warranty on the heat exchanger from Johnson Controls. All other model components include a 10-year limited warranty. HVAC products from Johnson Controls, marketed under the well-known Coleman® brand, include energy-efficient, residential central air conditioners, heat pumps, furnaces and accessories and innovative light-commercial, packaged heating and cooling systems marketed through a national distribution network and delivered to home- and building-owners through qualified Coleman heating and cooling contractors. For more information about Coleman, visit: www.colemanac.com.